In a large glass or stainless-steel bowl, whisk together the lemon juice, vinegar, salt, pepper, and oregano; add the oil slowly, whisking. 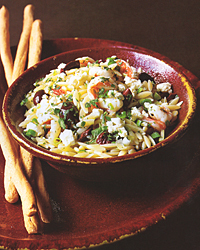 Add the orzo and shrimp, the scallions, olives, and feta to the dressing and toss. Serve warm or at room temperature. • Substitute chopped fresh marjoram or dill for the oregano. • Add some diced cucumber to the salad. • Toss in some chopped tomatoes or halved cherry tomatoes. Pinot Blanc shows up in many versions around the world and is always at home with food. Here you should look to northern Italy's Friuli or Alto Adige for Pinot Blancs with subtle fruitiness and fresh herbal accents.